Review: Heart- breaking, exciting, adventurous, loving… all of these describe Thunder Rolling in the Mountains. The book is very thrilling, and seems to be historical fiction and an adventure story wrapped into one! This book takes place during the Gold Rush of 1849. Sound of Running Feet (main character and narrator) is taken from her home in Wallowa. Next thing she knows there is war after war, many lives are lost, and she finds herself getting closer and closer to death. The book includes many adventures, sad losses, and historical battles. Thunder Rolling in the Mountains is an amazing book. The book begins in a beautiful land with fast flowing rivers and long grass. There are tall and monstrous yet pretty mountains, and large, majestic animals grazing everywhere. This is the land of Wallowa, Sound of Running Feet's home. Sound of Running Feet and the tribe of Ne-mee-poo or as the Blue Coats call them, the Nez Perce tribe have been forced from their land and had to travel to the Old Lady's Country, or Canada. There are many battles on the way and family, friends, and neighbors died. "This hatred sickens my heart. All men were made by the same Great Spirit Chief is. Yet we shoot each other down like animals." The ending of the book is sad, and it brought tears to my eyes. Thunder Rolling in the Mountains is fascinating. There were many things that caught my eye while reading the book. The text had many moods to it, but it mostly focused on depressing and exciting. I liked this because it made the book very surprising and alive. 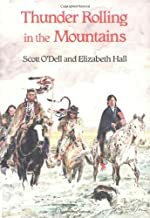 I believe Thunder Rolling in the Mountains is an unforgettable story about the "tragic defeat of the Nez Perce tribe, a classic tale of cruelty, betrayal, and heroism." I especially love how Scott O' Dell (author) adds romance with the young, independent and brave young woman, Sound of Running Feet, and Swan Necklace (Sound of Running Feet's fiancé). Their romance made me worry about what would happen between the two of them, and kept me wanting to read more. This book not only tells the story of the Ne-mee-poo or Nez Perce, but also of their customs and beliefs, their culture. An example of this is, "He was shot when he rode his horse close to the Blue Coats to show he was a brave man." Another example is how the text repeats often about how the Great Spirit Chief made everyone, and how the earth is our Mother. Thunder Rolling in the Mountains is definitely one of those books that you will finish in three days because you always want to keep reading it. I recommend this book, especially to someone looking for a short, thrilling book to read. I am sure that anyone that reads Thunder Rolling in the Mountains will feel the same way I do about this book. I give this book five stars. We would like to thank Houghton Mifflin Harcourt for providing a copy of Thunder Rolling in the Mountains for this review. Have you read Thunder Rolling in the Mountains? How would you rate it?